There’s one thing that everyone seems to be talking about lately in the AV industry: design. Now that technology has become so prevalent in the home, homeowners and interior designers are starting to demand smarter and more attractive options for tech integration—and they’re looking to AV professionals for the answers. While this might seem like a new challenge, it’s been our focus all along at Leon. We sat down with Noah Kaplan, Leon’s Founder & President, to get his thoughts on why everyone is so laser focused on design these days, where he thinks the industry is headed, and how Leon is designing for the future. Q: Design has become a hot topic in the AV industry. Why do you think the conversation has finally made its way to the mainstream? A: Consumers have only recently started to become comfortable with smart home products, and now that they are, they’re asking for everything from smart shades and lighting, to full scale wireless speaker systems. As more and more devices are showing up, interior designers can’t ignore them anymore, and they’re looking for aesthetically pleasing ways to integrate tech into their designs. The popularity of social sites like Houzz and Pinterest have only fueled the fire too, making homeowners more inspired than ever with instant access to thousands of beautiful images. They want their home to be a reflection of their personal style, and because the ability to customize products is so commonplace in other industries, they expect it from ours too—and it’s up to us as manufacturers to deliver. Q: While the design + technology conversation might be trending right now, it’s been Leon’s focus all along. Why has design always been at the heart of what you do? A: As someone with a background in music and fine art, I have always cared about style just as much as I do sound. 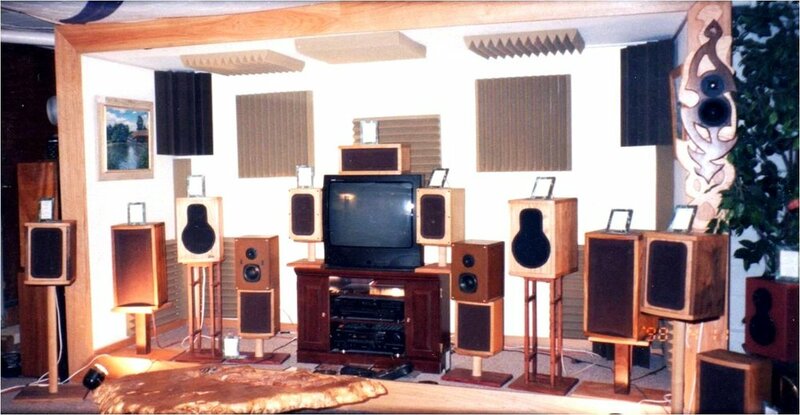 We opened our first shop to the public in 1995 and it was a collaborative space that housed a woodshop, an art gallery, a recording studio, and a listening room. While Leon has grown since then, our roots in the arts still guide us today. As inherently creative people, we can’t help but think about design. Creativity is in our DNA. Q: Leon is best-known for soundbars, but a lot of people might not realize the full breadth of the product line. Beyond the soundbar, what are some other solutions Leon offers to help better integrate technology into the home? A: We started all those years ago with a mission to get speakers off the ground and have them blend in with the TV so well that you wouldn’t even notice they were there. That’s when our custom-width soundbar was born. After that took off, we branched out to include architectural speakers, subwoofers, outdoor audio, and more. Today we’re proud to offer a full palette of audio products with endless options for customization, like custom sizes and dimensions, colors, grills—anything you want, we can do it. We also have an entire line of Media Décor TV concealment products that help homeowners personalize their technology with art. These products have been a big hit with the design community because they offer ultimate technology concealment. Q: Do you think this heightened awareness of design will start to influence products from other manufacturers as well? A: If you look back in history, design used to be the norm. Big companies like Philco, Zenith, and Braun all hired influential designers of the time to make everyday products like radios and TVs beautiful, desirable objects. Design and technology used to be deeply interconnected and it’s only in recent decades that the connection has been lost. I’ve been seeing some technology companies step up their game up when it comes to design though, like Samsung with The Frame that was designed in collaboration with Yves Béhar. Lutron and Control4 have been diving deep into shade styles and light fixtures too. I can see the focus slowly starting to shift. Change is a slow process, even today, but it’s happening. Q: What steps is Leon taking to reach interior designers and architects? How important do you think the collaboration is between our industries? A: I think it’s very important for us to collaborate, and the more we can learn about each other’s trades, the better the outcome will be. We’ve been working with designers since our inception, but something new that we’re branching into now is continuing education. Last year we launched our very first IDCEC-approved (Interior Design Continuing Education Council) CEU course. It covers the history of technology in relation to design and teaches interior designers & architects how the two can be harmonious. We’ve presented it a few times now with great interest and attendance and we’re looking forward to getting the message out there even more in 2019. We also hosted an event at CEDIA this past year called Bourbon & Brownies where over 100 interior designers and architects were invited to our booth to learn about our company and our products. We loved touring the group around and seeing them get excited about some of the solutions we offer, and we hope the channel continues to support this type of outreach. The demand is definitely there. Q: You’ve been in business for over 20 years now, what do you think the next 20 years will look like for Leon? A: From our standpoint, it’s time to rethink the grand design. To refine our mission. To continue to push product development beyond what people expect. Our vision to mix art with audio and design with technology has and will always remain the same, but our products will undergo a radical transformation. Creating that balance between technology and design is the pathway to the future. This interview first appeared in the Winter 2019 issue of Connected Design magazine.